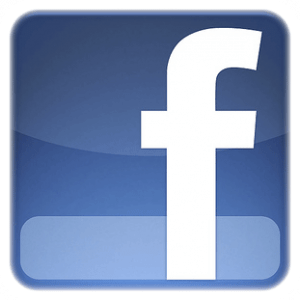 Arisia Rrab with Joel Carroll! 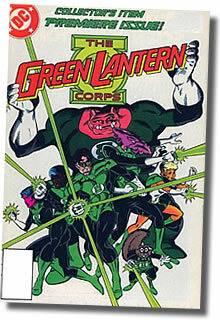 Last week, 5MM buddy, Joel Carroll, posted some incredible drawings of the Green Lantern Corps on Twitter. View them in their emerald glory here! 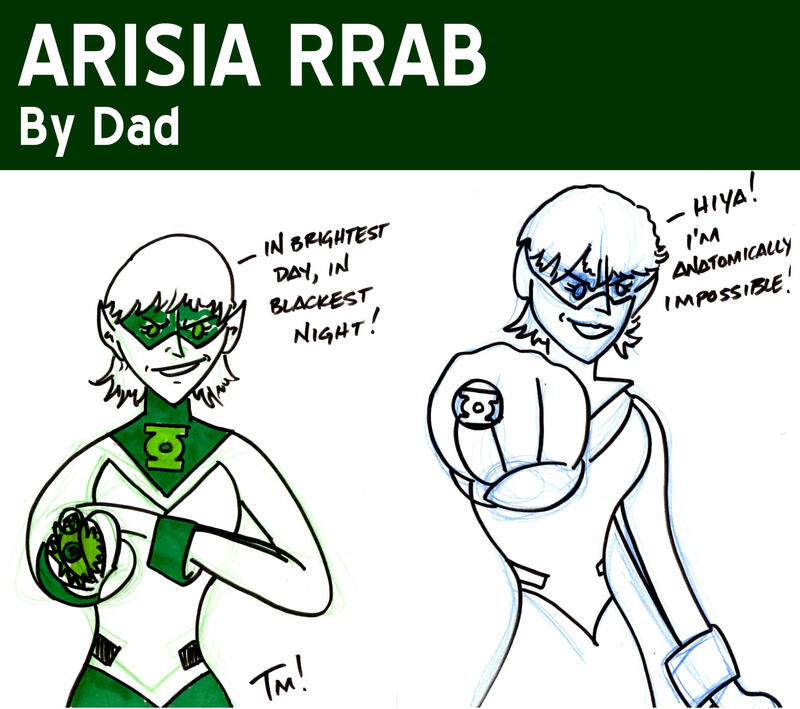 So, the girls and I contacted Joel and decided to draw Lantern Arisia with him. After all, what little girl could resist this spunky, fashion forward lantern? Not Grace and Cate. I decided to be cool, take a few extra minutes, and try some forced perspective. I didn’t like it. No worries. I drew again. I still didn’t like it and got frustrated, which is something I keep telling the girls not to do when we draw. We’re supposed to be having fun and learning. And, then it hit me … the whole process of 5 Minute Marvels has provided many teachable moments for the girls about hard work and patience. The artists the girls and I admire have honed their skills over the course of years and lots of sweat equity. And, they never stop working on and learning about their craft. I’ve only been back drawing a short time. So, I have many, many bad drawings left in me as I learn. And, that’s a piece of wisdom I can share with my girls. So, there’s only one thing for it. The girls and I just need to keep drawing and learning … five minutes at a time. And, now a word from Joel! Created by Sheldon Mayer, the original Red Tornado is often credited with being one of the first female super heroes. 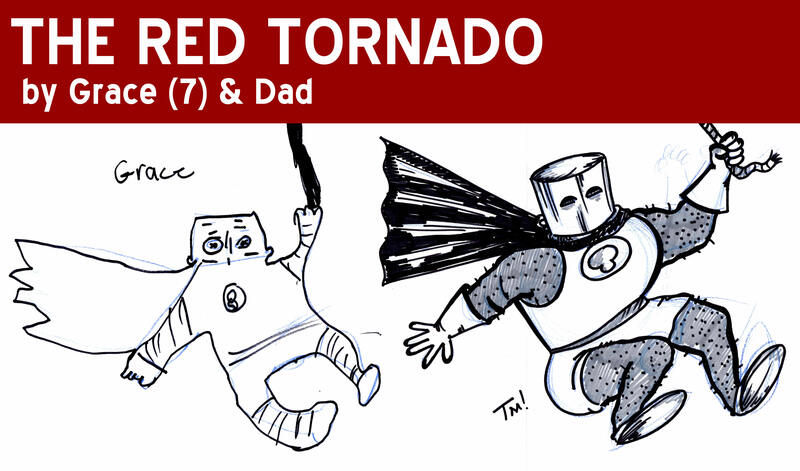 Forgotten for many years, Red Tornado, AKA Ma Hunkel, has had a bit of a renaissance of late. While I think Grace’s whole drawing is great, I especially love the cape. 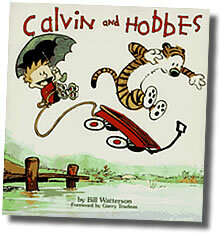 I was 12 years old when Bill Watterson started Calvin & Hobbes. My dad, who loves comics strips with a terrific passion, brought home the first compilation of C & H and said, “You’re going to love this.” And, I did. Like so many others, I was entranced by the wild abandon of Watterson’s imagination, the brilliance of his craft and his respect for his audience’s intelligence. Opening the Sunday funnnies to see Calvin & Hobbes in color was a weekly tradition. When Watterson and Gary Larson (The Far Side) stopped producing their strips in 1995 and disappeared like the J.D. 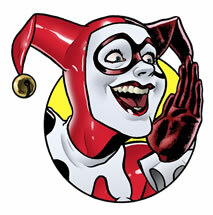 Salingers of the comics world … so did my interest in the daily funnies … and a bit of my childhood. 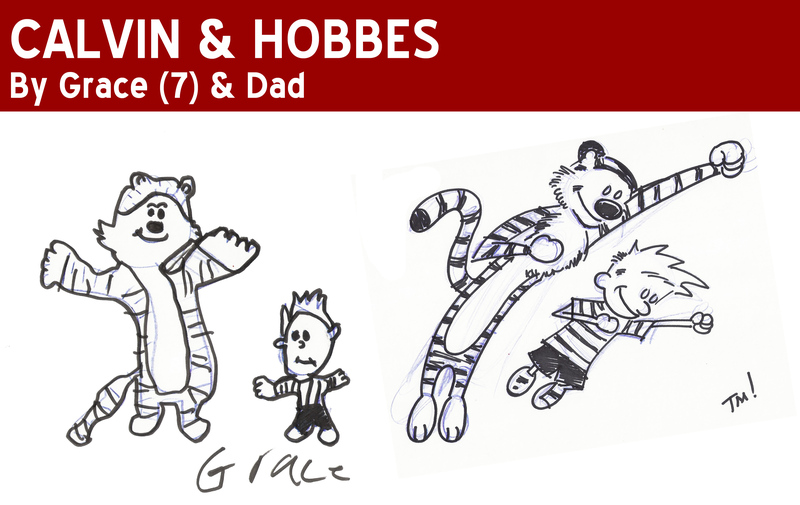 A few weeks ago, the boys over at Comic Twart did a week of homages to Calvin and Hobbes and the memories came flooding back. And, they inspired Grace and I to draw. Check out their work over at ComicTWART! When I started blogging a few years ago … before the birth of 5MM … a Google image search for a photo of Thor led me to this fantastic drawing by Maris Wicks. I’ve been a fan ever since. The girls, too. If you ever want to see how far you can push artistic limits in a one-panel comic, you need to check out Maris’ 100 Themes. It’s genius. 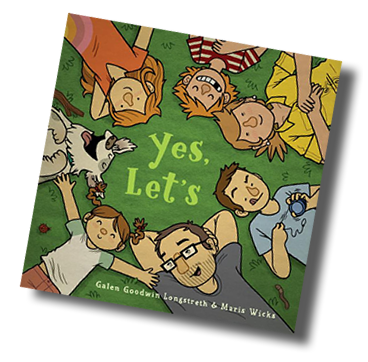 Last year, Maris teamed with Galen Longstreth for a picture book called, “Yes, Let’s.” Grace and Cate are convinced it was written about our family — although I have no idea who they think the two boys in the story are. 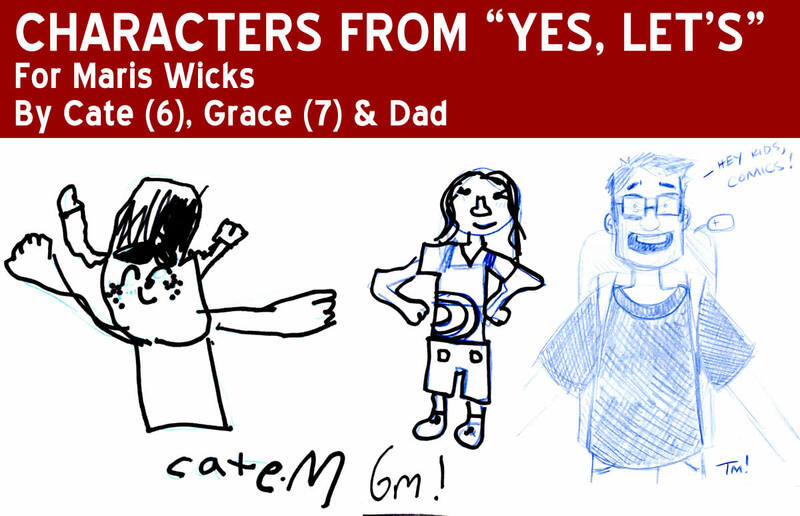 Last night, we drew the characters they think are based on our family. If you have a kid in your life, go to BuyOlympia.com and buy a copy of this tremendous book for a mere $6! Grace and I have been working on anatomy for a while now, so we decided to work on facial expressions. 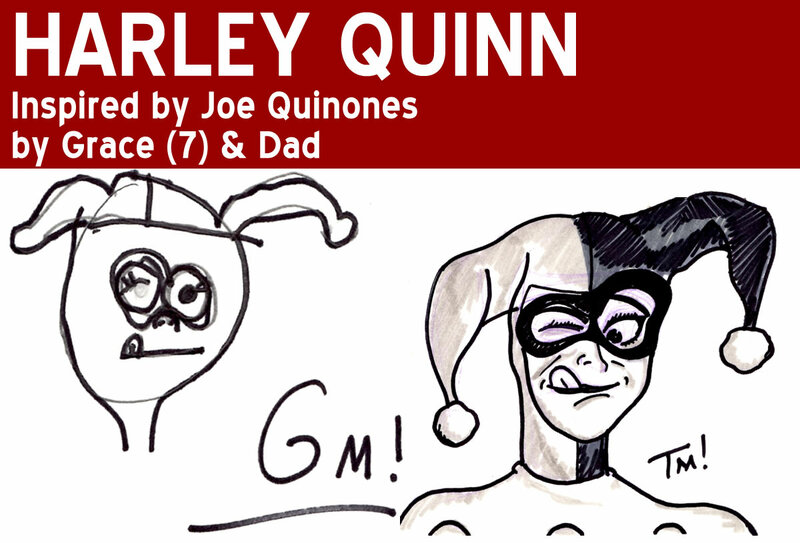 Artist Joe Quinones has an amazing way of capturing a wealth of emotion in his characters’ faces. On his Web site, he takes pains to demonstrate how he uses photography of himself and his friends, including artist Maris Wicks, to guide his work. Joe’s work provides great inspiration if you’re working in the art of faces. 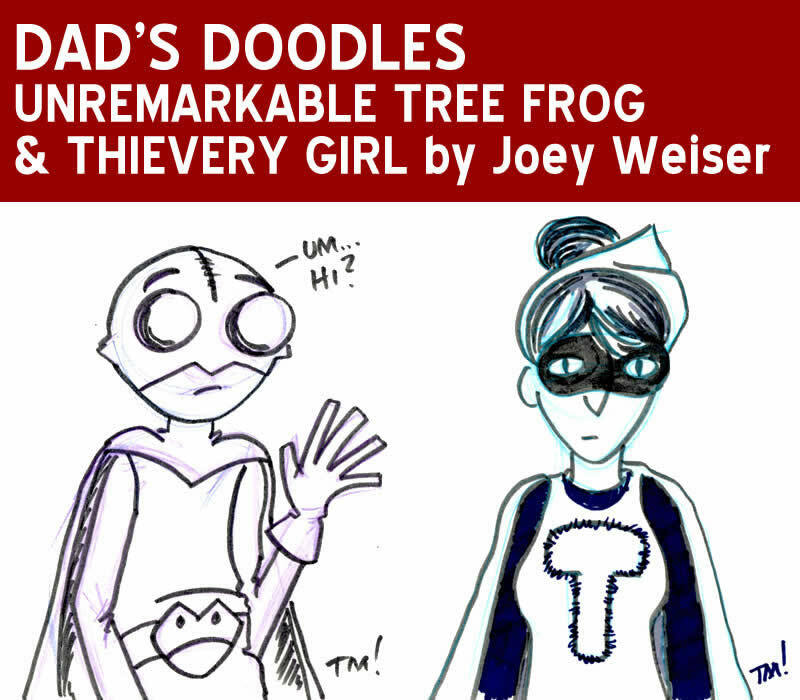 If you haven’t seen Joe’s work for Marvel and DC (Notably his Green Lantern strips for Wednesday’s Comics), swing on over to his “interweb blog” and get great insight into how he works. Okay, so when you’re essentially a fan art site, you don’t usually expect to get fan art … but that’s exactly what Grace and I got from our pal and curator of March MODOK Madness, Brendan Tobin. 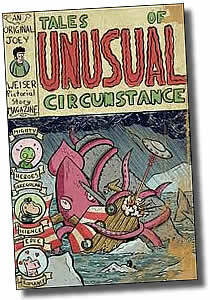 I was shocked the other day to find one of his mock-up covers starring Dude Fromage, a giant, super-strong chunk of stinky cheese I created in the sixth grade and Grace and I drew here last year. If only I could go back in time and show this to Sixth Grade Tim … okay, that and to tell Sixth Grade Tim to buy stock in Apple and to slow down on the pizza freshman year of college. People, click here to enjoy the majesty that is B. Tobin! And, now a word from Dr. Fab himself!